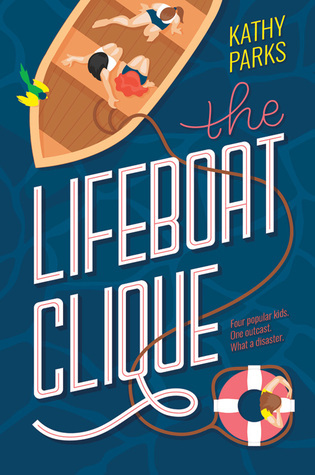 Alright, so let me start off by saying a big Thank-You to Harper Collins Canada for sending me a copy of The Lifeboat Clique to review. Secondly let me say Happy Book Birthday to Kathy Parks on her book coming out March 1st!! So this book definitely had a lot going on, so let's get to talking!! As I was reading this, I totally got a Mean Girls vibe happening. Like there was the one who was "queen B" which we all know thinks she is better than everyone. Then there is the one who is just so not the brightest light bulb in the tanning bed...if you know what I mean! And lastly, you have the one who obsesses over being the cool girl, she doesn't realize that it's just not working for her..."Stop trying to make Fetch happen...It's just not going to happen!!" The few things that really got to me in the story, was that I eventually found Denver to be the girl who did obsess about herself. Why all the girls hated her, or that everything started to be all about her, whether it was her fault or it happened to her, and I just kind of didn't really want to listen to her complain about things or talk about the past in the way she did. I mean, things happen, and all you can do is just move on if it isn't working out for you. The story was very fast paced, and if I didn't have so many things happening in a day, it would have been finished in one sitting! I found it to be really witty and funny with the little comments here and there. I felt like the language was really light-hearted one moment and the all serious and heartbreaking the next. Of course when there is a disaster as massive as this one, there tends to be a lot of losses. But there was really more than people not living that made some moments really deep. You take in more depth from the characters, as well as their own issues coming to the surface once they have been out in the water for so long. It also makes you really think about what the most important things are in life, and that comes out strong towards the end of the novel. I did really like that as the story went on you go from the past to present, to get a better understanding of what really happened to Denver and Abigail before the Tsunami hit. I think that it was really well written, and you get more and more of the puzzle pieces to understand more about the two who used to be inseparable. I kind of wished that there was more talk about the present rather than the past, because I felt like you missed out a little on it. Like you go from the Tsunami happening, and then in the past for a chapter, and then it's been a week since the Tsunami hit and they are on the boat. When I was reading this, there was one quote that I found more towards the beginning, but it really stuck throughout the novel and made me think more about life and how everyone is so different. "And I guess that's what I think of all stories. We think we know the limits of them and then we find out there's another story lying right on top of them." Overall I did really like the book. I found that there were a lot of topics being discussed in it that makes anyone of any age really think. I know they say that in high school there are always going to be cliques, but to be honest, there will always be cliques everywhere in the world, whether you're in school or not! It's something that just happens, and you are sometimes forced to deal with it, or you just accept it...Just like Denver. Of course with any amount of time spent with someone, you really take another look at who they are, and more often than not, you find something similar with them, and that's how a bond happens from people who never could see eye to eye. I think that this was a great read and I definitely suggest reading it! It was cute, fun, and clique-y. It was light-hearted but also caught you in the heart and made you feel so upset over the characters. It has definitely opened up my eyes more about what's important in life, and I think that's what really captured the book as a whole. Kathy Parks did a great job with it!! So that is all for my review bookworms! I hope you enjoyed it, and I totally recommend picking up a copy if you're in the mood for a clique/ Mean Girls inspired novel! Until the next time! Keep Reading! !